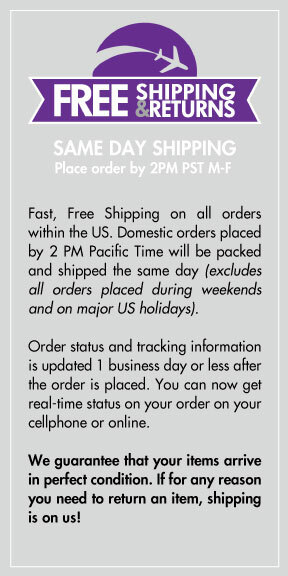 Fast Free Shipping on all orders within the US & Canada. We guarantee that your items arrive in perfect condition. If for any reason you need to return an item, shipping is on us! The Mobility Pads (Foot Circulation Formula) is based on Oriental and Ayurvedic Herbology. The foot pad's herbal blend utilizes far infrared (click for more info). heat to gradually generate warmth and dilate capillaries (for up to 10 hours). The all natural alternative to chemical circulation/soreness creams & patches. The The Mobility Pads are made in the USA with the highest quality standards. Box Contains 10 (10 hour) Foot Pads. 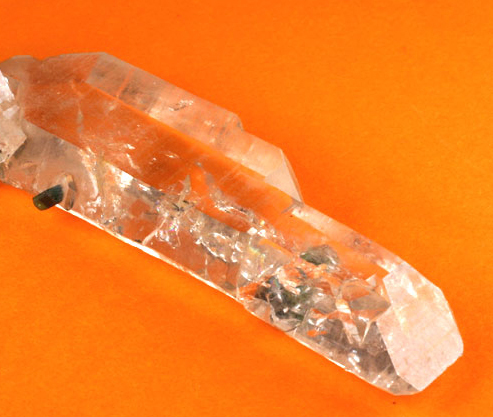 The most potent mechanic of the Mobility Pads is the infrared heat generated by the herbs/minerals. 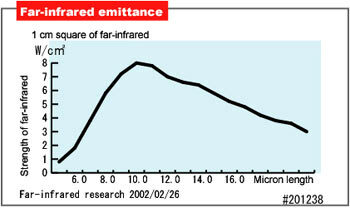 Infrared heat drastically improves circulation and causes thermal change by dilating the blood vessels. An incredibly powerful and stable alkaloid, Capsaicin is known as a potent anti-inflammatory. 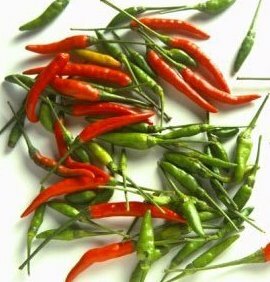 Research has shown that the application of Capsaicin can also suppress Substance P production (those suffering from arthritis pain commonly have elevated levels of Substance P in their blood). 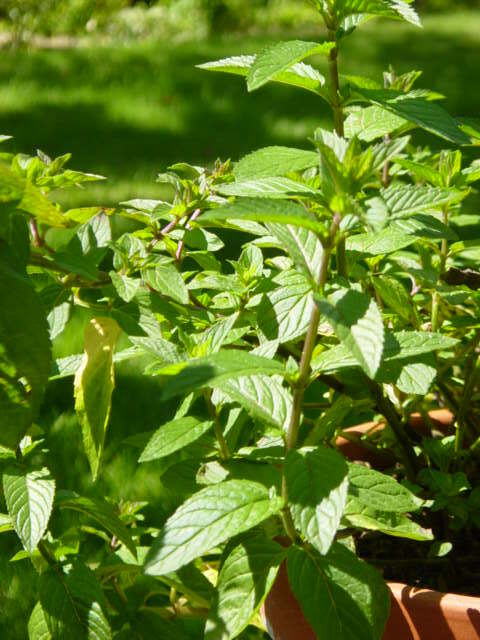 With a high menthol content, Peppermint is traditionally used to help sooth and relax muscles. 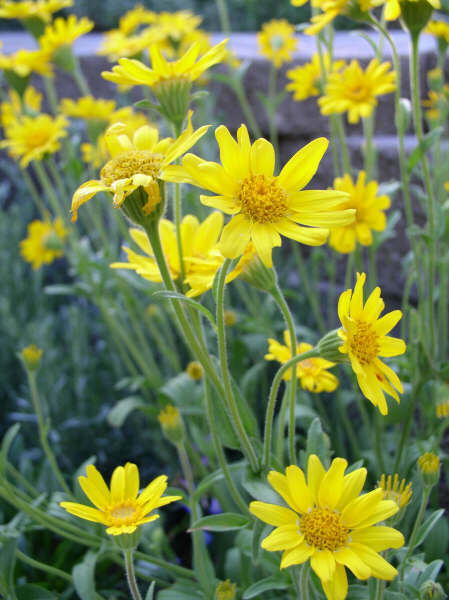 An anti-microbial often used in salves for bruises and sprains, Arnica has pain-relieving and anti-inflammatory properties. 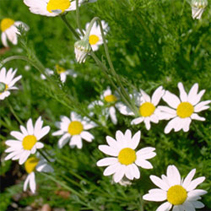 Used to improve skin conditions and for stress relief, Roman Chamomile has antiseptic and antibacterial compounds, and is known for its anti-inflammatory properties. 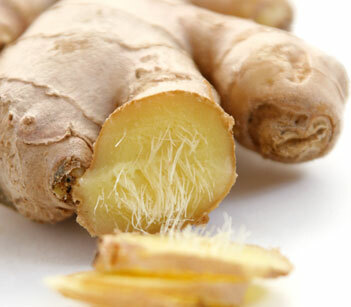 Widely used in herbal medicine to reduce inflammation, Ginger is also an Aryuvedic remedy for rheumatoid arthritis, osteoarthritis, joint and muscle pain. 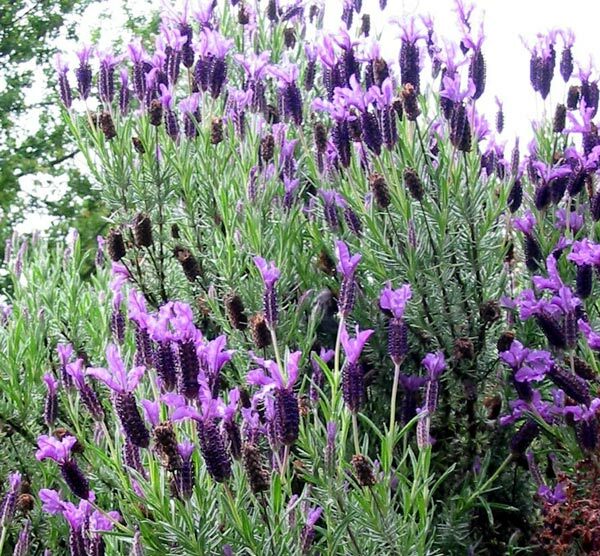 Used extensively in herbalism, the essential oil from lavender flowers is used as an antiseptic and to reduce inflammation. How do the Mobility Pads work? 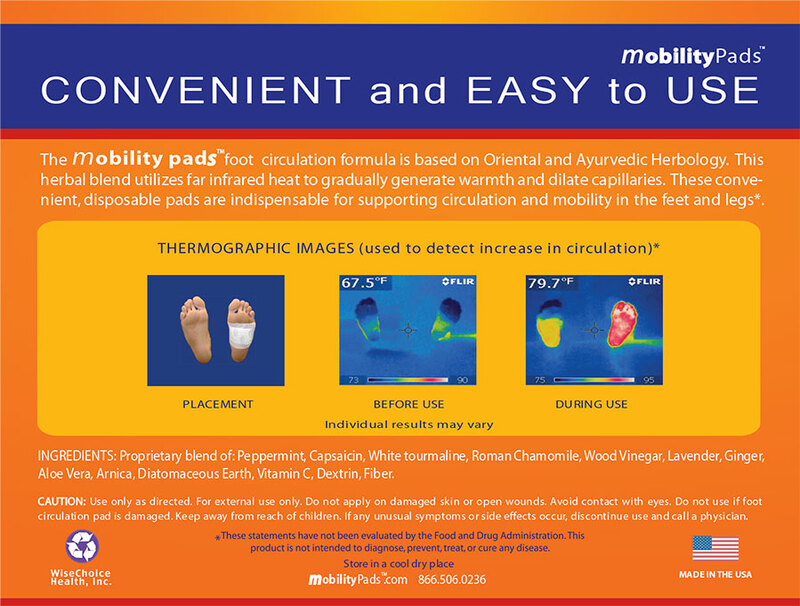 The Mobility Pads contain an all-natural herbal and mineral formula which produces far infrared heat. This gradually generates warmth and dilates capillaries, therby helping to improve circulation and mobility. For more information, please reference the 'Product Description' section. How do I apply the Mobility Pads? Your order will include these instructions on the inside of the box. 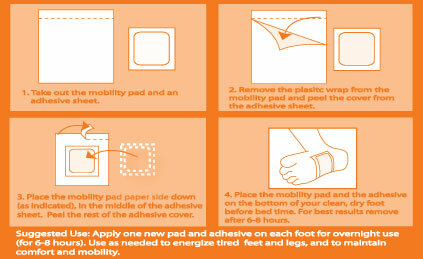 Originally, the Mobility Pads were developed from feedback based on our BodyPure detox foot pads. The original formulation was designed to stimulate circulation as a means of detoxification. As our customers (including many diabetics) reported excellent results when using the pads to improve the circulation in their feet and legs, we went back to the drawing board to create a new foot pad. The detox specific ingredients were minimized while maximizing the ingredient content for circulation. We then researched and added the herbs best suited to enhance the effect of the Mobility Pads. The following image depicts the placement of the Mobility Pads, a thermographic image with one pad placed on one foot, and a thermographic image taken 6 hours after placement. As the blood flow increases, watch the thermographic images change color! For Instructions on how to apply the pads, please see the the 'Product Q and A' tab. The statements made within this website have not been evaluated by the Food and Drug Administration. These statements and the products of this company are not intended to diagnose, treat, cure or prevent any disease. Please consult your physician before implementing any new diet, exercise, and dietary supplement programs, especially if you have preexisting medical conditions or are taking prescribed medications. The statements made in this website are for educational purposes only and are not meant to replace the advice of your physician or health care provider. All Copyright © www.bodypure.us or its affiliates. 3830 Valley Centre Dr. #705-151, San Diego, CA, USA. Phone: 310-204-4484.